Holyhead Marine was very proud this week to relaunch HMS Pickle following work to her keel and various items of machinery onboard. The vessel made for an impressive sight on the yard and the guys enjoyed working on a boat that was so unlike anything we have had on the yard in recent years. 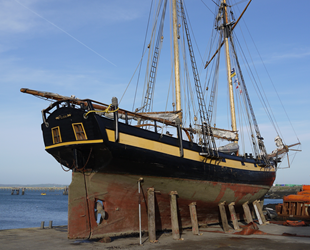 With the work complete the vessels owner doesnt plan on having to lift her out again for a number of years. She is now headed back to her mooring in Conwy.